There are 7 routers total and 4 autonomous systems. We’ll be using EIGRP as the IGP for link reachability. In addition, all of the BGP peering will be done with the physical interface IPs, I am not using loopbacks for the iBGP peering since there aren’t any redundant paths. Let’s assume that EIGRP is up and all local physical interfaces are up. Let’s also assume that BGP is up and configured with neighbors on each router but there is no additional configuration. So this is interesting. Router2 has exactly one path to reach each prefix both of which are through it’s directly connected link to router1. Also note that the 172.64.1.0/24 prefix shows an AS path of ‘400 ?’ while the 192.168.1.1/32 prefix shows an AS path of ‘400 i’. Since the static route (172.64.1.0/24) was redistributed into BGP, the origin of the prefix is incomplete. However, since the loopback was redistributed using the network statement it shows an origin of ‘i’ meaning that it came from manual redistribution. Note: When I see the ‘i’ I like to think that it means that “I manually injected that route into BGP” where as ‘?’ means that redistribution did it for me. Looking at the router6 BGP table we see that it has a single path to each prefix through router7. Note that I already updated these iBGP peering with the next-hop-self command. The final route diagram we have is rather interesting. While some of it makes sense, other parts don’t. For instance, why is router4’s best path through router5? Why does router5 only have one path to the prefixes when it clearly has two equal cost AS paths to the prefixes. Have you figured it out yet? Im hoping some of you figured it out when you saw the first diagram. I broke the cardinal rule of BGP. 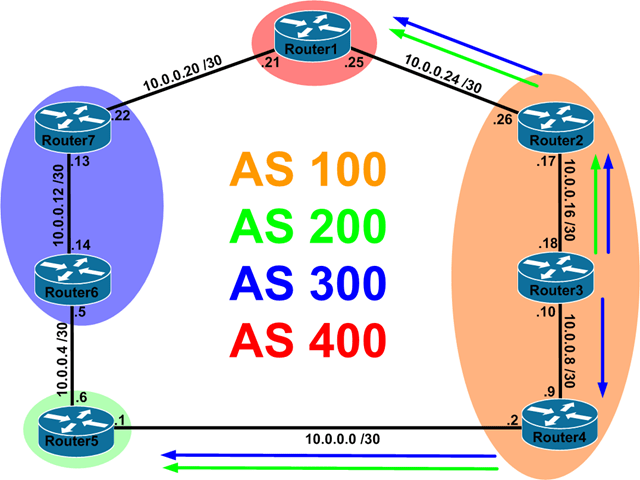 All BGP routers in the same AS need to be peered to each other. This is because all BGP routers will only share their best route with other neighbors. In addition, iBGP advertisements don’t get re-advertised to other iBGP peers. 1. Router1 sends its updates to router7 and router2. 3. Router7 sends the update to router6. Router6 marks the path through router7 as its best path since its the only one. Router2 sends the update to router3 which marks the path as its best path since it currently only has the one. 5. Router5 advertise the path it learned through router6 to router4. Since router4 doesn’t receive any advertisements from router3, it becomes router4’s best path. 3. Router7 sends the update to router6. Router6 marks the path through router7 as its best path since its the only one. Router2 sends the update to router3 which marks the path as its best path since it currently only has the one. Router2 also sends the update to router4 which also marks it as it’s best path since it’s currently the only one it has. On router5, the AS path for each path is the same length. Without diving into BGP path selection (that’s the next post!) 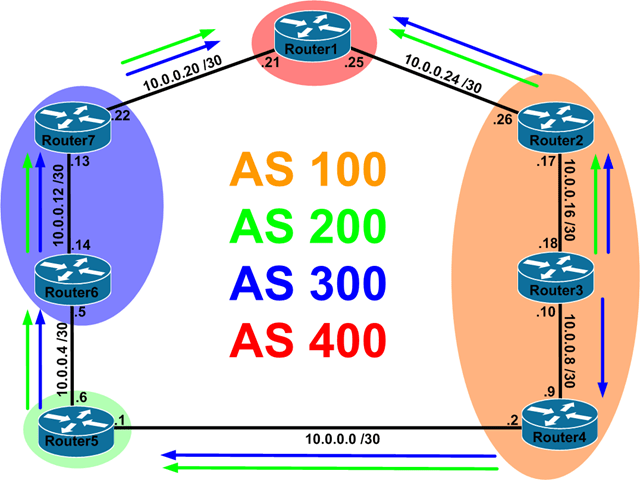 I can tell you that the route through router6 (10.0.0.5) is being selected since it’s the oldest route. -Only the best path to any given prefix is advertised to another BGP peer.